Drive the main freeway south from St. Denis to St. Pierre, continue to Le Tampon. The 4-lane road continues to Le Tampon, but the name changes to N3. In Le Tampon, continue to follow N3, from here just a normal road. Drive uphill and pass through La Plaine des Cafres. Shortly thereafter, you arrive in Bourg Murat. Here, in a traffic circle, fork right following signs that says "Volcan". 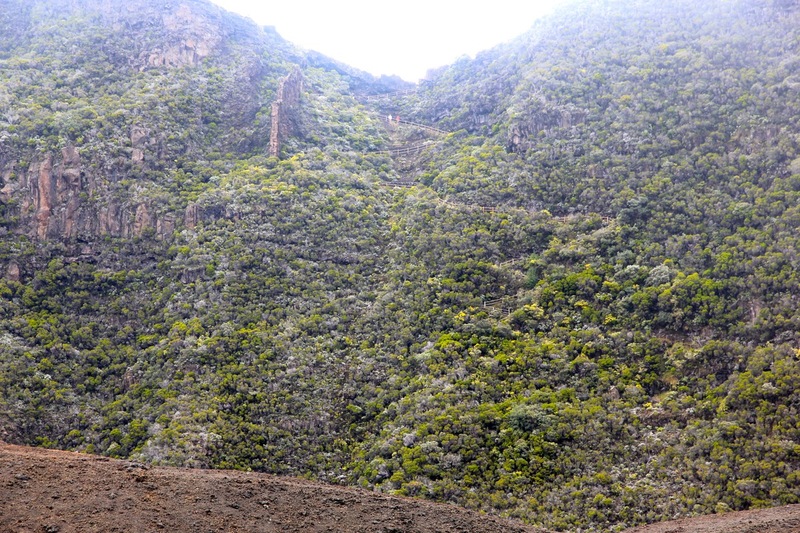 This road will climb through forest and reach high ground above 2300 meter, before descending sharply. From here, (in 2014) the road was only dirt and with lots of potholes, quite bumpy. Drive until the road ends in a large parking area at location S21.22512, E055.68475, elevation about 2360 meter. This is the trailhead named Pas de Bellecombe. 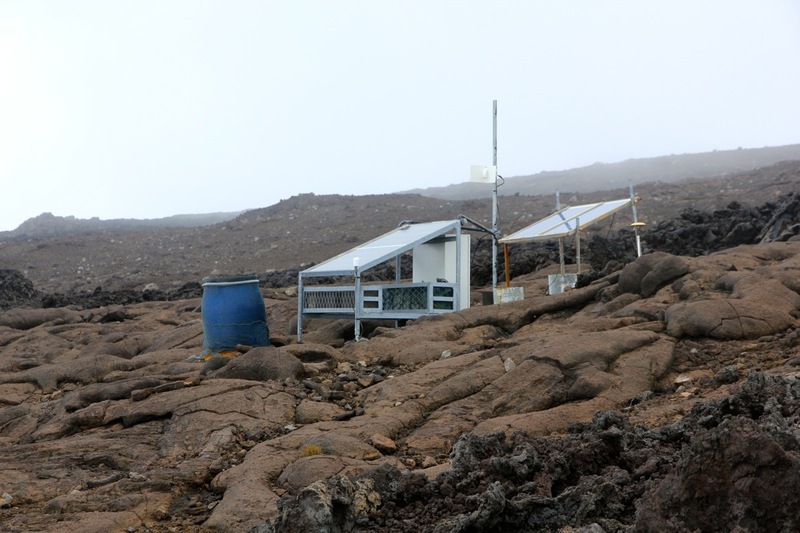 The highest point of La Fournaise is officially "off-limit". There are numerous warnings and signs that try to tell the same story, but it is not entirely clear "how illegal it is" to climb this summit. Some signs use the word "prohibited", while others just say "warning - do not..etc". This is the most relevant message. 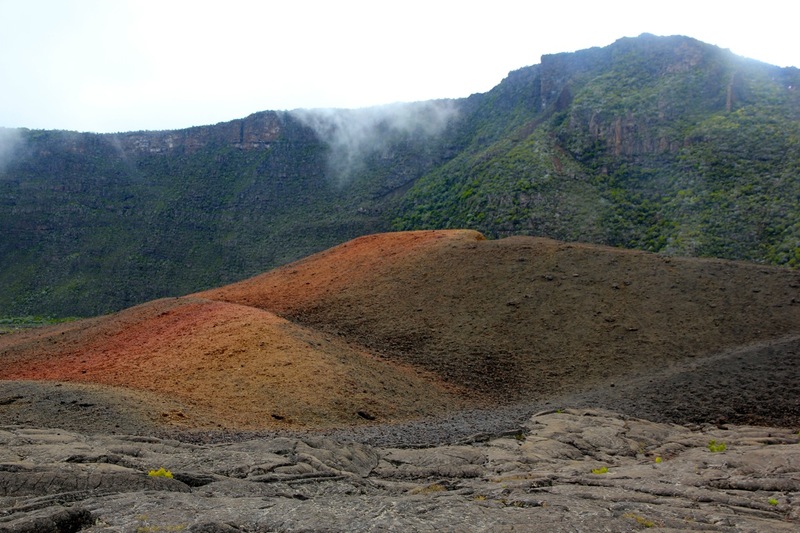 The highest point of this volcano is located exactly on the rim of the Bory crater. Thus, in order to get there, you must ignore this sign, or alternatively, decide that this summit point is a point you rather NOT visit. 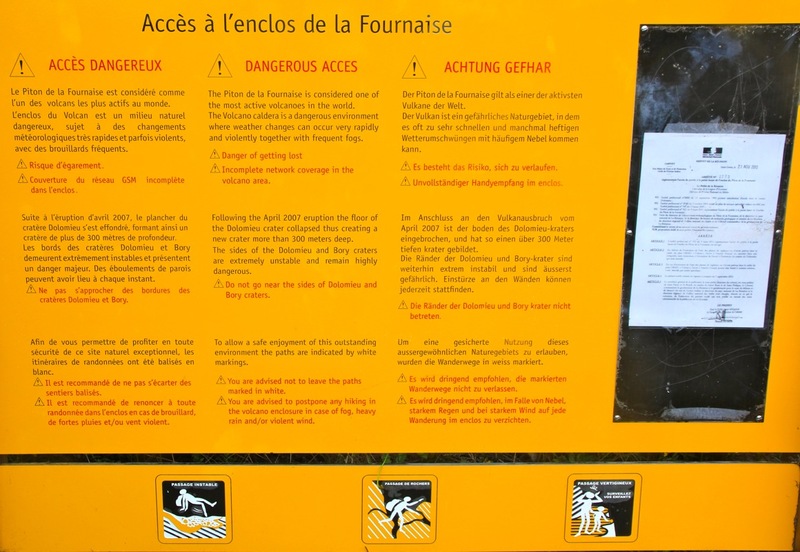 One can follow an official marked trail to view the Cratère Dolomieu, however this is at least 100 vertical meter lower. When facing the viewing area, you should turn left and follow the wide, but somewhat rugged footpath. 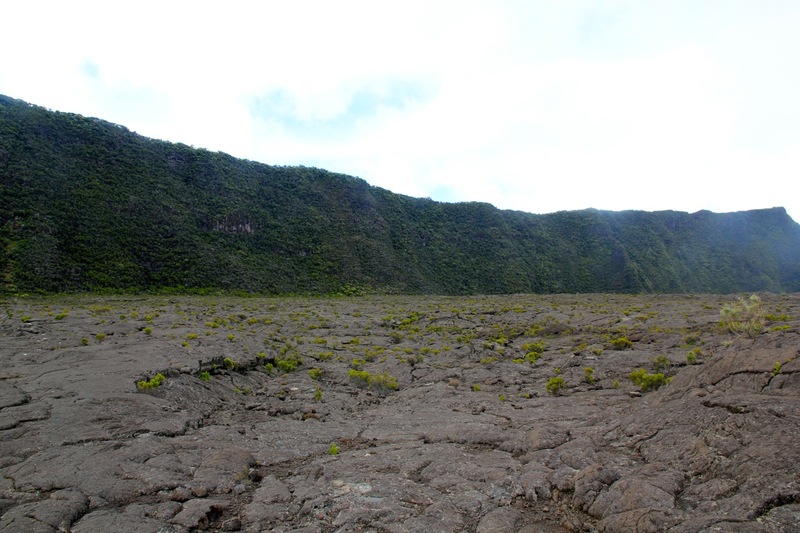 It leads gently downhill to a distinct gap where one starts the steeper descent to the crater floor. There is a gate at this point that may be locked. I wondered a bit about this, but a quick look around convinced me that I would be able to climb back out in case they locked the gate before I had returned. The trail descends in zig-zags and with many steps down to the flat crater floor. This descent is about 150 vertical meter. Once down, you will note a trail marker as well as general information. 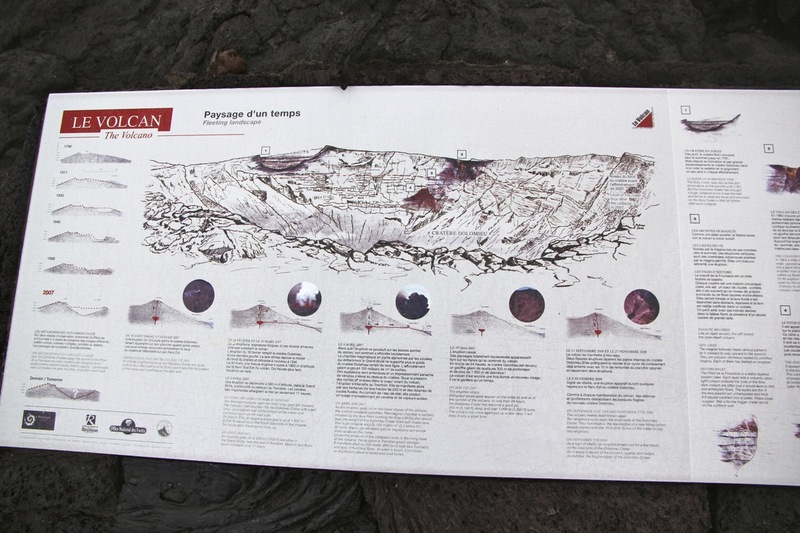 The walking routes are marked with white paint on the lava surface. 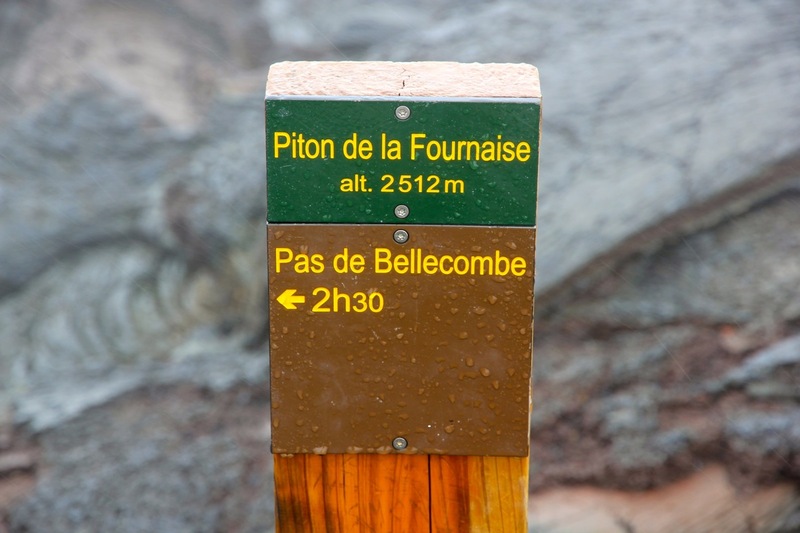 Proceed directly away from the (outer) rim following the trail called Piton de la Fournaise - Cratère Dolomieu with an estimated time of 2:45 one way from this marker. 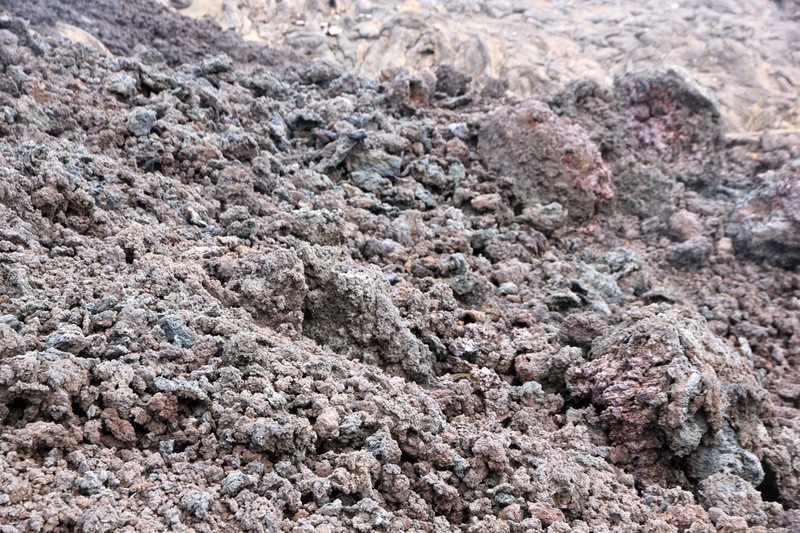 There is a small hill with nice colors just at the beginning. The trail starts to go more uphill after passing some interesting lava domes. Continue to follow the white markers until you reach near 2500 meter. At this point, roughly at S21.23790, E055.71307, leave the trail going more right and uphill. Be aware that this terrain is dangerous. There are deep cracks - at least as dangerous as crevasses in a glacier! Stay away from these and find a stable/safe place from where you can jump across when absolutely needed. There are numerous other signs of potentially unstable ground, try to pick your route along a rock surface that looks solid. To compare with glacier travel is obviously not entirely correct, however, similar care and judgement should be used, rocks are (like ice) pretty strong as long as they are not too thin and well connected. If you have visibility, the highest part of the Bory crater rim will become visible as a ridge. 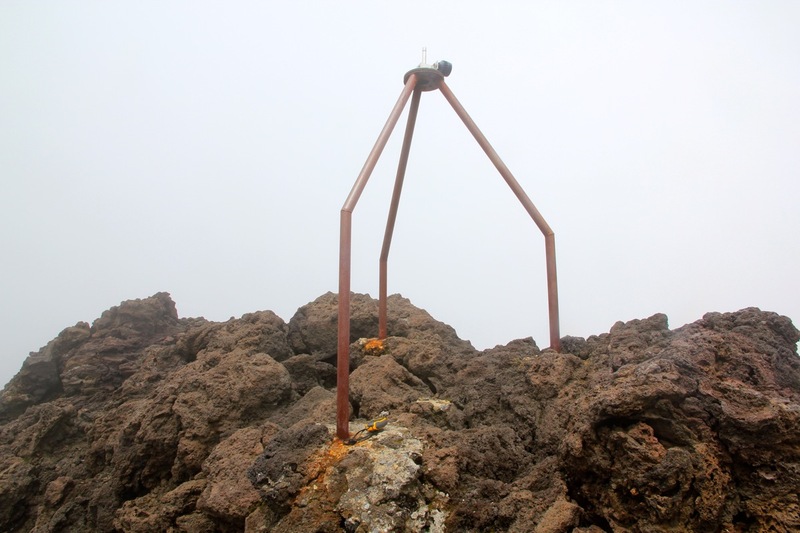 There is a small metal structure marking the highest point. Approach it from the outside and directly up the last, slightly steeper slope. Return along the same path in order to minimize risks and get back to the white marked official trail. After about 2 hours of driving, I arrived at the parking/trailhead around 1015. There was a drizzle of rain with fog and very limited visibility. 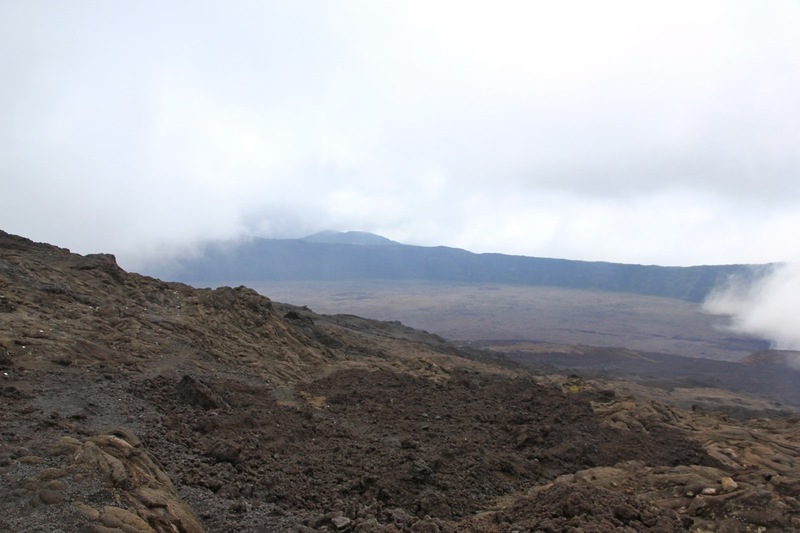 I left at 1030 and quickly found my way to the trail that descends to the outer crater floor. 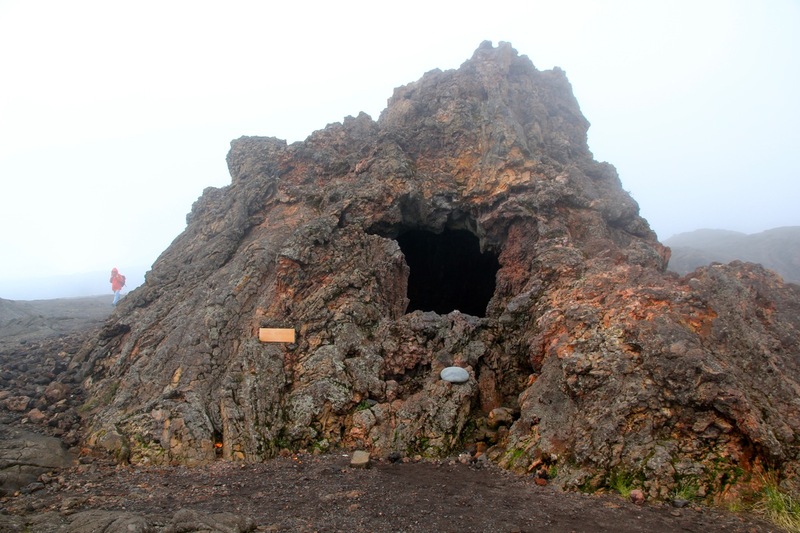 The fog prevented any views of the volcano itself, but I took the trail marked to Piton de la Fournaise and gradually, I could see an uphill slope in front of me. I continued to about 2450 meter of elevation, then tried to head more directly towards the summit. However, it was very foggy and the terrain was unpleasant, so after about 10 minutes, I retreated back to the marked path. I made another attempt slightly higher, but with the same result. 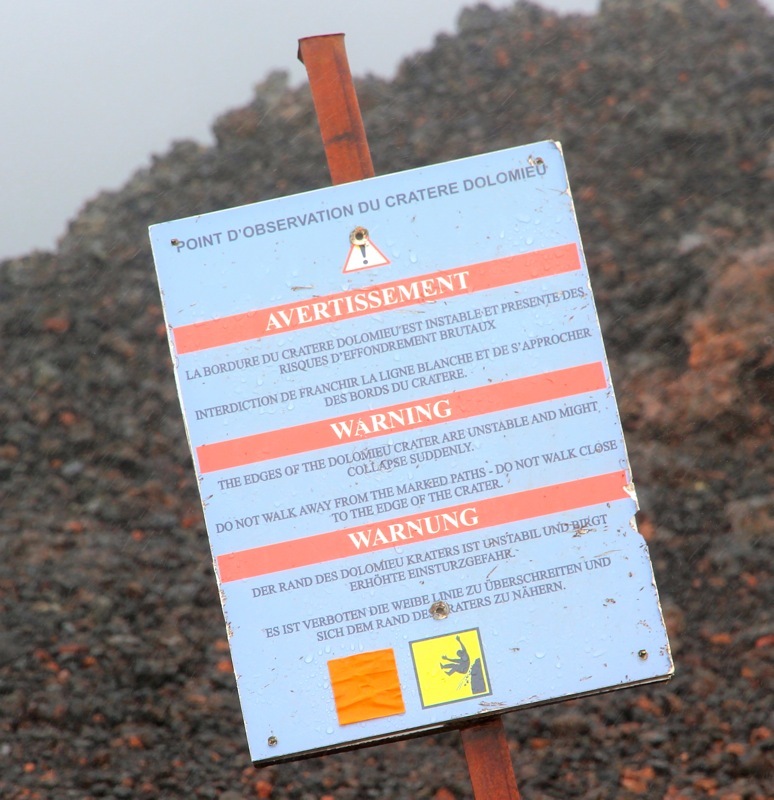 I now decided to complete the official hike along the marked path to the Cratère Dolomieu, that is the main crater of La Fournaise. It seemed that it would just be too dangerous to try climbing the highest point without better visibility to guide in finding a reasonably safe route. Continuing along the white markers, I arrived at the crater rim at 1245. 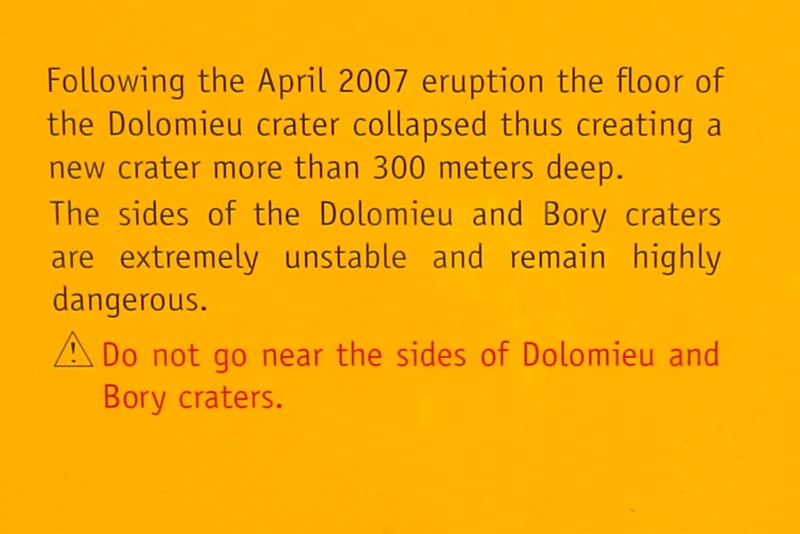 It was still a lot of fog, I read some of the posted information, but never had a chance to see the crater itself. Leaving at 1300, I started my way back to the car. 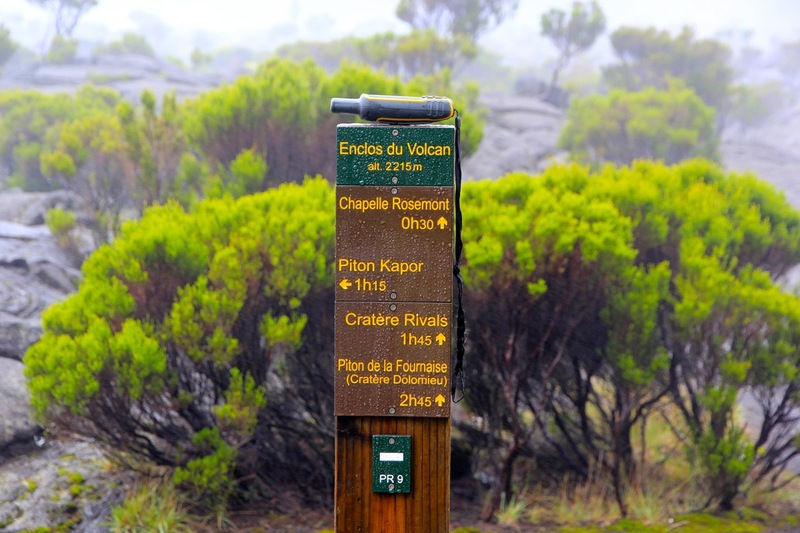 Walking along in the mist and rain, I staged a small debate with myself, if hiking this mountain and seeing all the volcanic scenery was more important than actually bagging the summit. After all, the fact that this was a P600 (infact a P1000) had made me make this trip in the first place. Given this, I would not really see or experience much more if I had been able to get to the summit. Perhaps as an answer to my questions, all of a sudden the clouds broke and I could see across to the outer rim. Moreover, I could now also see a lot more of the landscape above. I was close to the right place to break off from the trail and with somewhat better conditions I decided to give this summit a final try. I carefully picked my way and I had turned my GPS on in order to get a well defined track. 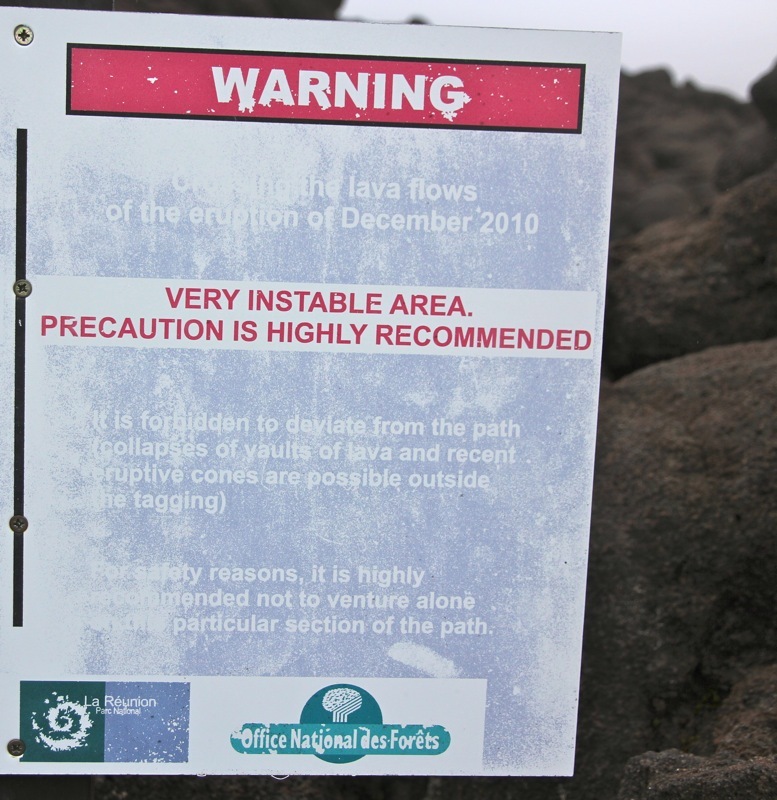 The terrain was highly variable, some recent lava tubes, some heaps of lava rock, then more black and grey rock, lava that had solidified. After a short while I came across terrain with "crevasses", they were not more than a meter wide, but seemed bottomless. I jumped across one in a place that looked "rock solid", then avoided a few more by walking in a few zig-zags. Higher up, I noticed some sort of solar powered instruments. My guess is that this is monitoring equipment. From here, I was able to see the highest point for the first time. It looked very much within reach by now. I made a nice arched path that lead me to the outer side of the final ridge. Here, I could see some traces of old tracks. I also spotted an iron marker on the highest point. A final, somewhat steeper slope and I arrived at the summit at 1405. I spent about 5 minutes, taking a GPS reading, then prepared to leave as the weather was again closing in. Hiking back to the official trail was now pretty easy, as I followed my GPS track carefully, retracing my steps. i continued down to the flat area, then across and up the final 150 meter of ascent arriving back at my car by 1530. On my way home, I ran into the worst fog I have ever experienced when driving a car. The road was somewhat poorly marked with white paint on various rocks along the roadside. However, the visibility essentially went to zero. I needed to stop and exit my car to look for the road several times. Driving extremely slowly with my 4 emergency lights flashing, I discovered an oncoming car when it was about 4 meters away directly in front of me! Fortunately, the other driver was equally slow and cautious. I was driving at about 2300 meter above sea-level, the bad conditions continued until the road finally descended below 1900 meter (and therefore out of the cloud! ).